After adding the data you wish to export, select Export to be taken to the download screen. Choose between GIS, CAD, Google Earth, CSV or PDF file formats. See the full list of supported export formats here. Depending on which format you chosen, you may be given the option to choose between various forms of map projection. You may also be able to choose to download tabular data in a range of formats, including Shapefile, MapInfo TAB, File Geodatabase and Geopackage / SQLite. 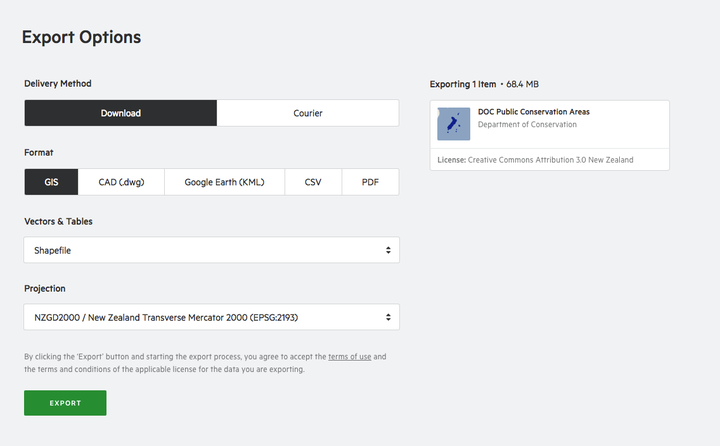 You can then make a final decision on which data layers or table in your collection you wish to export. Select Remove to remove them from your collection. Select Export to download your data. Or, select Cancel to cancel the export and return to the map.